Through their fishery regulation and seafood labeling programs, the Marine Stewardship Council works with partners to promote sustainable fishing practices and protect marine wildlife in oceans around the world. The International Fish Oil Standards (IFOS) Program is the most trusted third-party testing and certification program exclusively for fish oils. A rating of five stars indicates that a product passes all testing categories. ConsumerLab.com is the leading provider of independent test results and information to help consumers and health care professionals recommend quality health, nutrition, and wellness products. 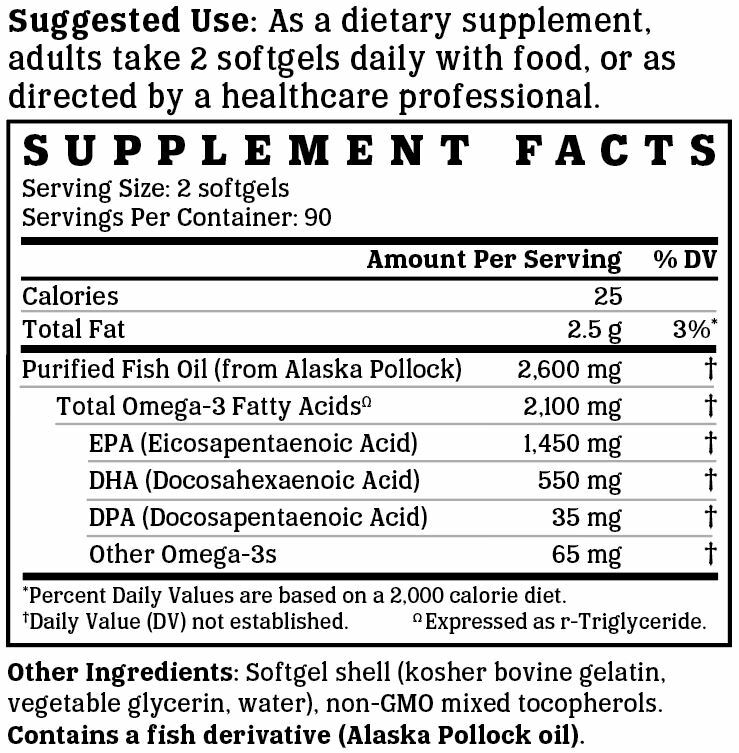 Triple Strength Omega-3 Fish Oil features 2,100 mg of exceptionally pure EPA and DHA per softgel, concentrated from cold water fish sustainably sourced off the coast of Alaska. The fish oil is processed within minutes on FDA inspected vessels, and is IFOS 5-star certified and ConsumerLab approved to meet objective purity, potency, and freshness standards. 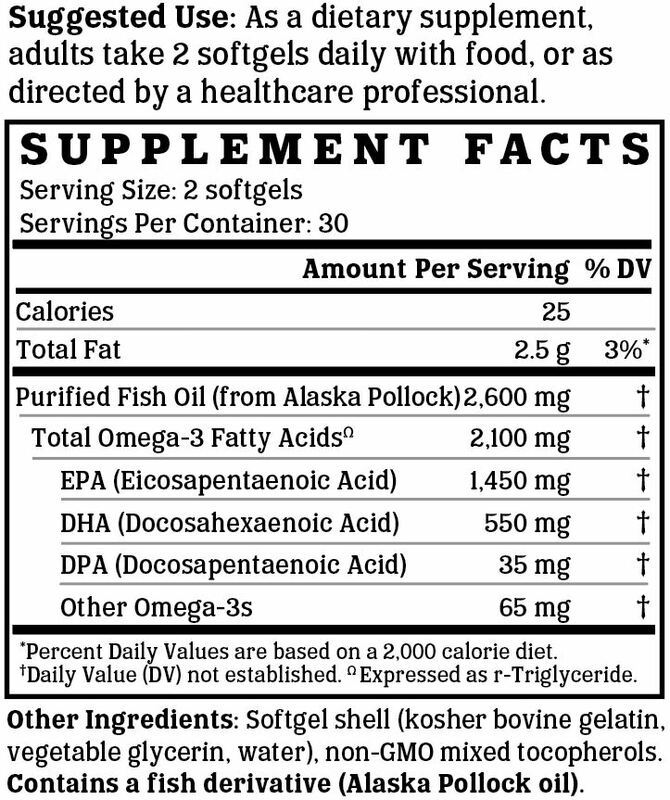 Triple Strength Omega-3 Fish Oil is manufactured in the USA to industry-defining quality standards and is verified by independent, third-party labs to meet all label claims. Omega-3 fatty acids, also known as polyunsaturated fatty acids, are essential to many of the body's functions, but cannot be synthesized by the body. Instead, to get the required amounts, they must be taken in from food or supplementation. Omega-3 fatty acids can be found in fish, such as pollock, salmon, cod, tuna, and halibut; other seafood, including algae and krill; and some plant and nut oils. Omega-3 fatty acids play an important role in supporting cardiovascular and joint health, are important for brain function, and are crucial for normal growth and development. Most fish oil supplements are either available in ethyl ester form or triglyceride form. Structurally, the major difference between the two forms is that in ethyl ester form, the fatty acids (EPA & DHA) are esterified to an ethanol backbone, while in triglyceride (TG) form, the fatty acids are esterified to a glycerol alcohol backbone. The Marine Stewardship Council (MSC) is a nonprofit organization that addresses the issue of unsustainable fishing, and helps safeguard seafood supplies for the future. Their official seal on Triple Strength Omega-3 Fish Oil shows that we do our part to secure a healthy future for our planet's oceans. Offered by Nutrasource Diagnostics, the International Fish Oil Standards (IFOS) Program is the most trusted third-party testing and certification program exclusively for fish oils. With frequent submissions, Triple Strength Omega-3 Fish Oil is reviewed by their experts, earning an exemplary rating of 5 out of 5 stars. ConsumerLab.com is the leading provider of independent test results and information to help consumers and health care professionals recommend quality health, nutrition, and wellness products. Their official endorsement of Triple Strength Omega-3 Fish Oil is a reflection of its quality. We like to make supplements that can be enjoyed by everyone. That's why our products are always compliant with the best practices for avoiding allergens and minimizing cross-contamination. 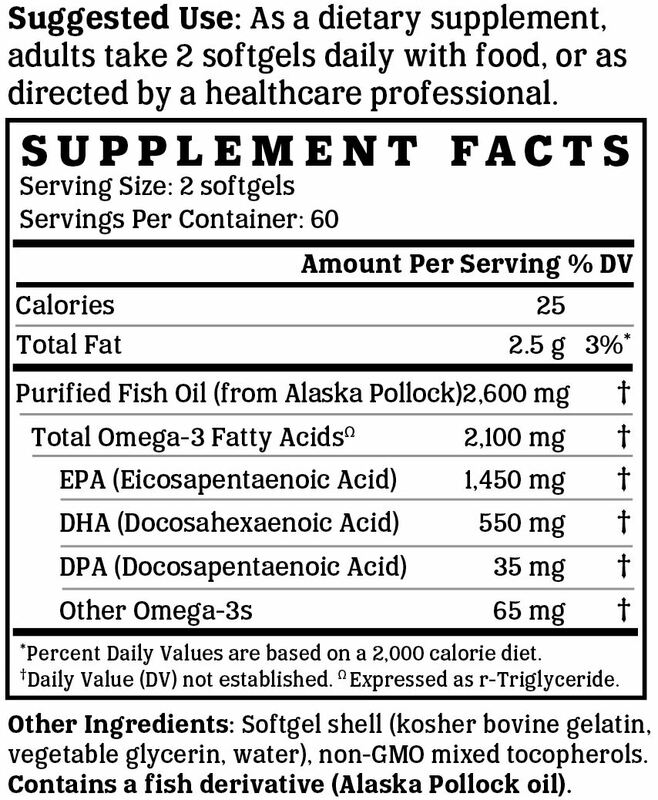 Triple Strength Omega-3 Fish Oil is free of soy, gluten, egg, milk, peanut, shellfish, and corn allergens. Consistent with our guiding principle to “do no harm,” Triple Strength Omega-3 Fish Oil is manufactured without the use of additives or preservatives. It contains absolutely NO contaminants, pesticides, herbicides, harmful additives, residual solvents, magnesium stearate, or hexanes. Like all NutriGold products, Triple Strength Omega-3 Fish Oil is subject to over 140 purity and potency assays by independent, third-party labs to ensure that the product meets or exceeds its claims. So, you can be certain that what's on the label is what's in the bottle. Nothing more, nothing less.